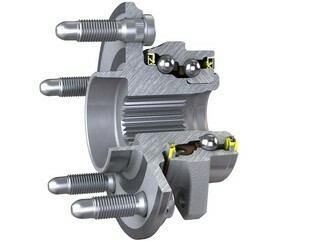 SKF launched the SKF Low Friction Hub Bearing Unit, an energy efficient wheel end for cars. The product reduces friction by more than 20 per cent compared to previous generations of SKF standard hub units,and provides CO2 savings ofup to 0,6 g per km.When based on an annual mileage of 14,500km, the saving is 9 kg CO2 per year. This equates to a reduction of 9000tonnesof CO2 per year if one million cars were equipped with the SKF solution.The SKF Low Friction Hub Bearing Unit is included in the SKF BeyondZero* portfolio. “In SKF we are dedicated to develop and deliver energy efficient solutions to our customers, and with this new hub unit we have used our broad experience and knowledge to develop a product that reduces friction even more than previous hub units, therefore continuing to reduce CO2 and fuel consumption”, says Aurelio Nervo, Director Car Chassis, SKF. The bearing internal geometry has been carefully analysed and re-designed. This re-design, as well as the development of a better, high performance grease, give a significant friction reduction. Further characteristic of the new grease is to provide longer life and a better resistance to micro-movements. The SKF Low Friction Hub Bearing Unit can be used for different sizes and configurations to fit different car models. It can be used in existing as well as future new hub unit designs. Savings estimates were calculated by means of the SKF Vehicle Environmental Performance Simulator (VEPS) software, using the New European Driving Cycle (NEDC) standard. *The BeyondZero product portfolio contains products that offer enhanced environmental performance characteristics. To be included in the BeyondZero portfolio, SKF products, services and solutions must deliver significant environmental benefits. The portfolio looks into different environmental aspects such as material selection, energy efficiency and reduction of lubricant leakage. SKF is a leading global supplier of bearings, seals, mechatronics, lubrication systems, and services which include technical support, maintenance and reliability services, engineering consulting and training. SKF is represented in more than 130 countries and has around 15,000 distributor locations worldwide. Annual sales in 2011 were SEK 66,216 million and the number of employees was 46,039. www.skf.com.